There's a general mouse breeder consensus of the ideal litter size of mice: four. This consensus has been reached by international, long-term (generations of breeders and countless generations of mice), large-scale (a large number of breeders) experience. This litter size has the smallest risk of deaths before weaning, result in well-fed youngsters growing up into good-sized adults. Breeders have also noted, that the difference between too large litter and ideal size litter can also be heard, not only seen: babies growing up in ideal size litter spend their time eating and sleeping, while babies growing up in litters too large can be heard crying in nest. There's also visible differences seen in mothers: does nursing ideal size litters stay fit throughout the whole ordeal, while others lose condition. Those who oppose culling out of principles generally do not believe the word of culling breeders on this, but argue that mice growing up in bigger litters also grow (eventually). At least those young, who aren't "culled by nature"*). Those opposing culling usually do not have ways of comparing the growth of a culled litter and a large, un-culled litter and those who oppose nature's ways of culling simply do not not-cull just in order to be able to document the differences for those who won't doubt their word. *) Calling deaths in a mouse litter "culling by nature" is a fact-averting name for death by starvation, which is a slow, very painful way to die. In effect it is one of the most horrible ways of dying. The other way of getting "culled by nature" is being killed by the mother, which literally is getting eaten alive. The mouse mothers tend to start eating their young from the rear end, so the mouse young is alive and feeling for quite a while when the eating is happening. Both are natural ways of dying, but both are simply horrible in being so painful and slow. Belly this big tells you there'll be lots of babies. It is the breeder's responsibility to make sure she doesn't have to try to take care of too many of them. Splashed doe, pic Johanna Salo. With the smallest litter size (two), none of the six test litters gave official results: the young lost weight in the first days of their lives and at least one young died. Epstein suspected two reasons to be behind the ill fate of the smallest litters. First, that does are able to distinguish between there two and eight young in the nest, even though they might not be able to tell the difference between four and eight. Second, the possibility of only two young hitting the same teat every feeding time is small enough to cause too many teats to stop producing milk, thus starving the young. Even with the daily rotation of mothers between nests, the young weren't mobile enough to find the milk-producing teats. When the tests were repeated, does were switched between two and four young litters, making the differences smaller: at first, the smaller litter grew slower, but after surviving for the first week, they catched-up the larger litter in size, even becoming larger. This would support the theory of the importance of teat stimulation on the overall milk production and verify the experiences of mouse breeders regarding the possible problems of milk production with litters of less than four young. Comparing the rate of growth between litters of 4, 6 and 8 (and 12) young, it was noticed that the young grew faster, when the litter size was reduced. The differences were remarkable: By weaning, the young growing up in a litter of four, weighed 70 % more than those who grew up in a litter of eight! Those growing up in litters of 12 were even smaller: they weighed 30 % less than youngster from litters of 8. In this experiment, the does had to feed litters of 8 or 12 (or smaller, note the deaths in litters) only for two days out of five, so they were met with less strain than if they were to feed a larger litter every single day. It's quite likely, that the differences in weaning age sizes would have been even larger, if the largest litters were cared for by one mother alone. When the ideal litter size is four, why not selectively breed mice to have only that many young? It is perfectly possible to select for small litter sizes, but this would eventually be more harmful than beneficial. E. J. Eisen's (et al's) study from 1980 shows, that the weight of the mother effects both the size of the litter she carries and the birth weight of her young. The size of the litter born, in turn, affects the the milk production of the mother. A mouse mother giving birth to a larger litter produced more milk than a mouse mother giving birth to a small litter. The difference stayed the same, even if the litters they eventually raised were of the same size. Combining these findings with those of Epstein's, one can deduct that large birth litter combined with growing up in a small litter is optimal for the growth of mouse young. Eisen (et al) also notes, that milk production is not only affected by the size of the litter, but also by the weight of the mother &emdash; weight as an indication of size, not having the doe being overweight &emdash; and this includes the weight of the mother even before the mating and at the time of her giving birth. In other words: a mother growing up well as a young, then being an adult mouse of good size, is able to take care of her own young better. Mothers who had been able to get plenty of milk as youngsters had larger adult sizes than those who hadn't and thus were better mothers themselves. Littermates, aged abt. 5 days. Even at this young age, uneven distribution of milk has caused the smaller one fall badly behind in development. Kirkpatrick (at al) studied the effect of litter sizes while in womb and growing up on the eventual size the mice grew into, by first selecting the amount of feti on fay 9 of pregnancy (test groups: 6, 10 or 14 feti) and then by distributing the young randomly to different mothers (5, 10 or 15 young) so that none of the young was raised by its birth mother. This study showed, that even though the size of the litter at birth affected the birth weight of the young, only the size of the litter the mice were growing up in, had an effect on their adult size. Again, mice growing up in smallest litters grew faster and even with the young from larger litters grew faster after weaning, they never caught up in size those mice who had a better start in their lives. Oh, but can't you get as well-growing youngsters with mothers who grew up in large litters, if you then cull her young? R.E. Nelson and O.W. 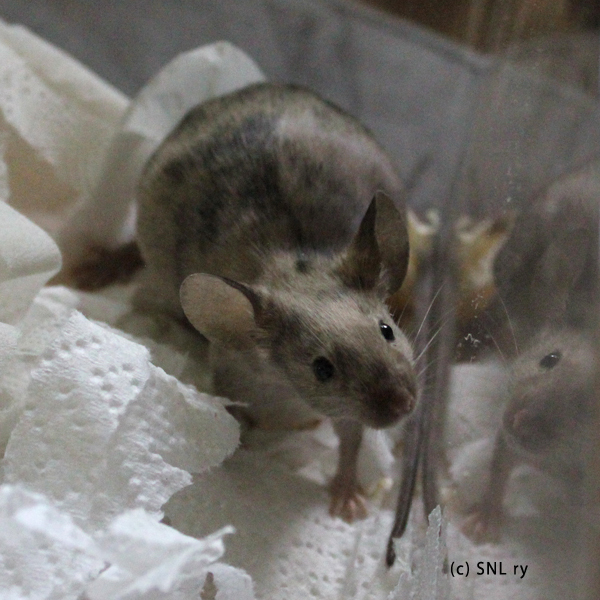 Robinson studied how the litter size mouse mothers grew up in affected her own litters. They compared the sizes and development of does that had grown up in quite large litters (those of 8 and 14 young). Until adulthood, the does that had grown in smaller litters were somewhat larger than those growing up in huge litter. Furthermore, they reached sexual maturity younger and were at that point larger than the does of huge litters at the same point of development, even though these huge litter does were older at that point. Comparing the genetic potentials of the does, the researchers found out that large size of litter while growing up had a bigger influence on adult size than genes. That is to say, mice with genetic potential to be large do not grow to their full potential, if they grew up in a large litter. ­Furthermore, does from smaller litters were able to have larger litters with more young born alive. When the doe's mother had had fewer mouths to feed, it could provide her young with better care and this in turn affected the young doe's whole life, including her own capability of rearing her young! Most important factor affecting an individual mouse's growth, among all possible ones, was proved to be the care provided by the mother. Thus, the amount of milk and care received as a suckling affects the mouse's whole life. Kirkpatrick & group arrived to the same conclusion: does growing up in smaller litters had larger litters themselves. They also found out, that these larger litters were explained by the does having more active ovulations. They were, in effect, physically more ready to deliver larger litters. In his study on the effect of litter size on mouse doe's maternal behaviour, Robin Priestnall picked three litter sizes to test with: litters of 2, 5 and 8 young. The babies were distributed among the does as soon as possible after they were born. There were 20 two-baby litters, and both young survived in 16 of them (= 80 %). Five-baby litters were 15 in number, of which 9 survived without losses (= 60 %). Of the litters with originally eight babies, only 3 had every young survive (= 13 %). While having reduced number of young from the original count, 3 litters of five and 4 litters of seven where included in the study, with the rest of the reduced litters not being included in research results. Priestnal found out, that does with fewer young spent more time in the nest taking care of her litter than those with larger litters. Mothers of small litters nursed their young more often and over all spent more time with them, washing them etc. Mothers of larger litters spent more time outside the nest, not only to eat but also to groom themselves away from her young. All in all, they spent time outside the nest being otherwise active than mothers of small litters. In the words of the researcher, they showed less maternal behaviour. The researcher speculates, that partial reason for mothers of large litters spending more time outside the nest is their need to spend more time eating and drinking themselves, but also considers findings of earlier studies indicating the behaviour being caused by increased stress due to the size of the litter. This stress, in turn, causes them to care less about their young. When does were fed directly above the nest, mothers of both small and large litters spent more time in the nest, but again the mothers of large litters left the nest more often. Mothers of large litters had their own eating continuously disturbed by her young trying to nurse, causing her to leave the nest and also to sleep outside. The amount of time mothers spend in the nest is important for the future development of the young. With large litters, the babies' temperatures could drop, as the mother spent more time outside the nest and the researches notes how changes in temperature influences the development of the young. Priestnall also suspected that the caring behaviour given by their mothers (like more frequent grooming and washing) experienced by the young of small litters had positive effects on their development. Priestnall notes, that the mothers of larger litters produce more milk than mothers of small litters, but also says that the amount of milk an individual baby gets diminishes in these litters as the babies grow. We learn, that the collective knowledge of mouse fanciers on the ideal size of mouse litters matches the findings of studies. The studies also verify fancier's thoughts about the benefit of using only does with good background for breeding. We learn that the first stages of a doe's life affect not only her own life, but the development and welfare of her future young. The most important lesson, however, is that those who truly care for their mice do not stress their does with too large litters, nor do they force their mouse young to compete for food and mother's care. As it is the human who decides that a mouse doe is to have young, it is the obligation of this same human to minimize the stress caused by pregnancy, delivery and nursing and that requires culling to the ideal litter size. As it is the human who decides that mouse young are to be born, it is the obligation of this same human to provide the young with the best possible start of life. Again, that requires culling to the ideal litter size. Pet mice do not live in nature, or in natural environment (which is a cruel place for a mouse, to begin with), so it is simply intellectually dishonest for somebody breeding mice to "hide behind the back of nature" and leave the mice to pay the consequences, thus affecting their whole lives. Eisen, E.J., Nagai, J., Bakker, H., Hayes, J.F. 1980: Effect of Litter Size at Birth on Lactation in Mice, Journal of Animal Science, April 1980, vol. 50, no. 4, ss. 687-688. Epstein, H.T. 1978: The Effect of Litter Size on Weight Gain in Mice. The Journal of Nutrition, Jan. 1, 1978, vol. 108. no. 1, ss.120-123. Kirkpatrick, B.W., Arias, J.A., Rutledge, J.J. 1988: Effects of Prenatal and Postnatal Fraternity Size on Long-Term Reproduction of Mice, Journal of Animal Science, Jan. 1988, vol. 66, no. 1, ss.62-69. Nelson, R.E. & Robinson, O.W. 1976: Effects of Postnatal Litter Size on Reproduction of Female Mice. Journal of Animal Science, April 1976, vol. 42, no. 4, ss. 824-830. Pristnall, Robin,1972: Effects of Litter Size on the Behaviour of Lactating Female Mice (Mus musculus). Animal Behaviour, Volume 20, Issue 2, May 1972, Pages 386–394. The copyright © to this site is owned by the Finnish Show and Pet Mice Club (Suomen Näyttely- ja Lemmikkihiiret), including all text and images. Even partial copying is prohibited and will lead to legal action. Permission for re-publication of any of the articles, photographs, drawings or any other contents of the site must be asked in writing from both the club and the original author / photographer / artist. Nothing on these pages is to be considered public domain or free for copying, unless there is a clear and distinct statement to the contrary.